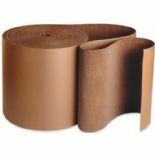 At Empire Packaging, we supply quality Corrugated Cardboard Rolls in different widths and lengths. Corrugated Cardbourd is a type of paper with fluted corrugated sheet in the centre. This type of cardboard is strong and is generally used in the protection of many items. This type of packaging material helps protect products in the post.